To be honest, I'm not quite sure how I've managed to walk by Breyers Triple Chocolate ice cream 30 times without trying it. I guess I was afraid it just wouldn't be that good. You know, the "white chocolate" would be vanilla, the dark chocolate would taste cheap, and the milk chocolate would be the same chocolate we always get. Well, I was trying to grab something quick Saturday afternoon, and my chocolate cravings told me it was time to give in and see if the ice cream tastes as good as it looks. I couldn't resist and my spoon immediately went for the white chocolate. Guess what? It tastes like white chocolate! It tastes like any decent white chocolate bar would, or a nice quality pudding pop. The milk chocolate is good, though it makes me long for TH Box of Chocolates. I was messing around and cut out a slab of the dark chocolate and it definitely has a fudgy look to it (oh man, I just made myself hungry for brownies). The dark chocolate is pretty good as well, though the brownie thoughts made me forget what it tastes like. I luv this ice cream! It's the best, any chocolate lover would like it. 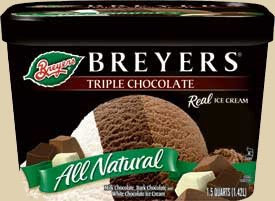 I agree that Breyers Triple chocolate ice cream is really good. However, I am hooked on Blue Bell Triple Chocolate Ice Cream. It is the best by far. Rich and hearty, unbelievably delicious. I was amazed by how good it was. 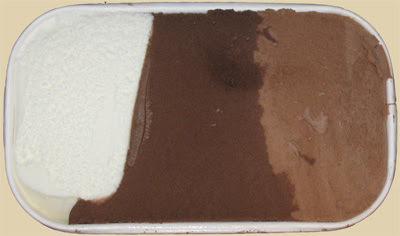 Trouble is Blue Bell's ice cream is seasonal and only available during certain times of the year. Too bad because I will be buying Breyers Triple chocolate instead when I can't get the Blue Bell, Blue Bell stop this 3 month nonsense already. I do not understand why they stopped making this! I have been completely devistated since I found out! @Anon: I have to ask, how often do you eat ice cream because this one has been gone a really long time... or do you mean nothing has replaced it in your heart of hearts since its demise? Please look around the site because I'd like to think that somewhere on this blog is something that will make you just as happy.